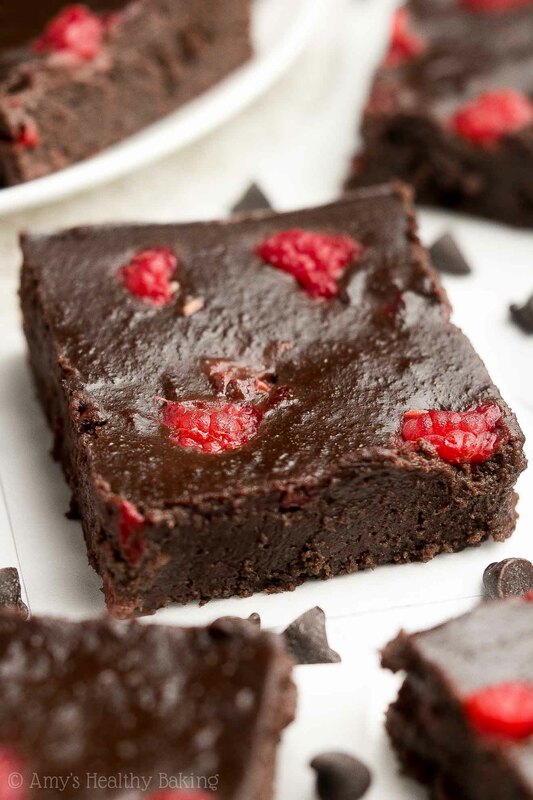 Supremely fudgy dark chocolate brownies full of fresh raspberries! 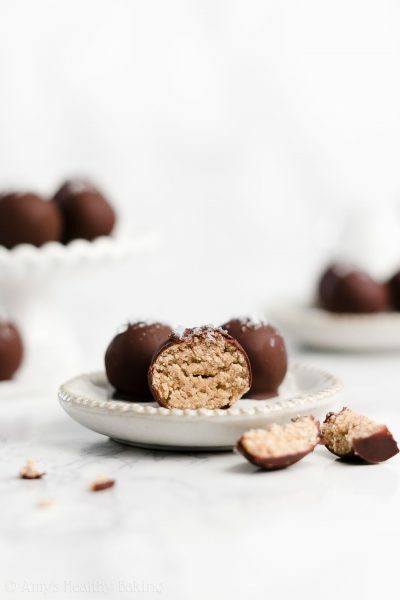 This healthy recipe is so easy to make & just 65 calories! 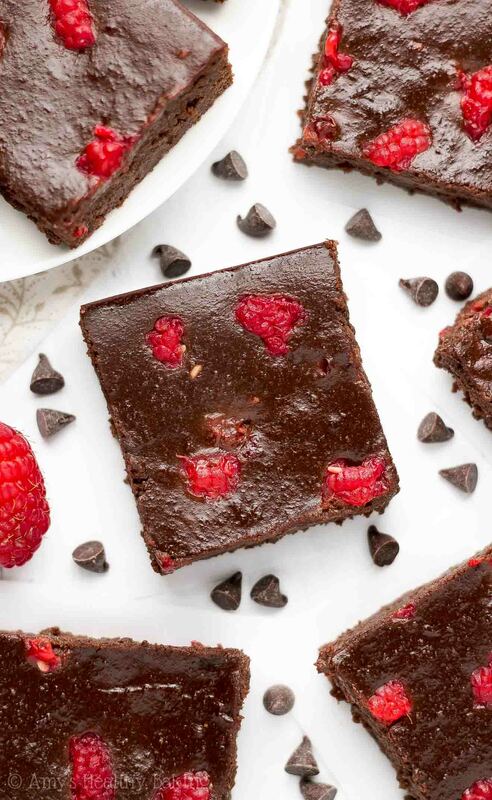 Perfect for Valentine’s Day—or any day you’re craving brownies! When I stopped by Target last week to pick up a few things, I giggled a bit as I walked toward the back of the store… It looked like a tornado of pink and red had swept through the aisles, leaving behind a trail of crêpe paper, balloons, and candy! But I also stumbled upon some new treats, like Oreos with spicy cinnamon flavored filling, Ghirardelli strawberry bark squares (instead of peppermint bark, like during Christmas! ), champagne flavored cotton candy and gummy bears, and cupcake flavored Hershey kisses…. To name a few. 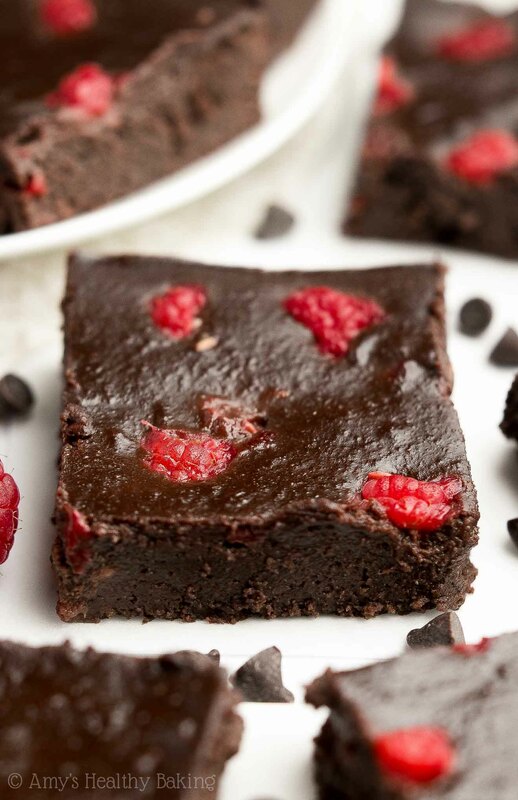 So when I arrived back at home, I mixed up a batch of these Healthy Small Batch Fudgy Dark Chocolate Raspberry Brownies to get my chocolate fix—without too many tempting leftovers! 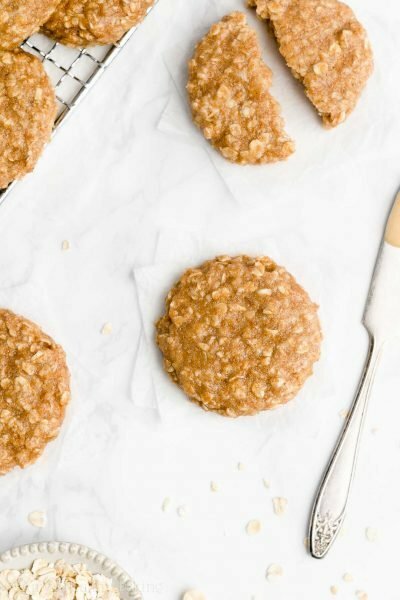 They’re extremely easy to make and just 65 calories! To make these healthy brownies, you’ll start with white whole wheat flour (like this!) and cocoa powder (like this!). 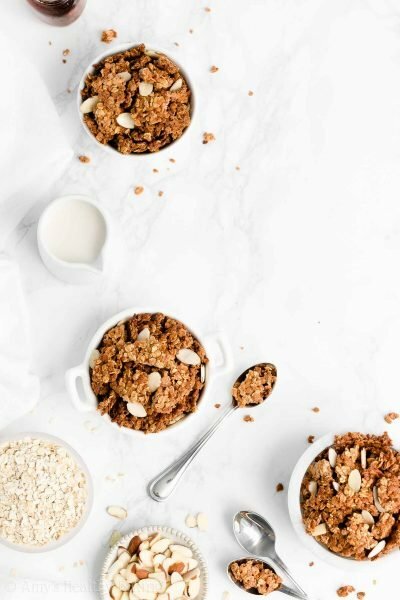 White whole wheat flour has the same health benefits as regular whole wheat flour, but it has a lighter taste and texture because it comes from a special variety of soft white wheat (hence the name!). That truly lets the rich chocolate flavor of these brownies shine! It’s very important that you measure the flour and cocoa powder correctly, using this method or a kitchen scale. (← That’s the one I own and love!) Too much of either ingredient will dry out your brownie batter, and too much cocoa powder will make your brownies taste bitter… Instead of decadent and dark chocolaty! Next comes just a tiny bit of melted butter or coconut oil… Because these guilt-free brownies get the rest of their fudgy texture from Greek yogurt! You know how much I ♡ Greek yogurt. It adds the same moisture as extra butter or oil for a fraction of the calories, and it gives your brownies a protein boost, too! To keep these brownies refined sugar-free, you’ll sweeten them with pure maple syrup (like this!). You want the kind that comes directly from maple trees. Skip the pancake syrups and sugar-free syrups! The only ingredient on the label should be “pure maple syrup,” and it generally comes in thin glass bottles or squat plastic jugs (like this!). Just before spreading the batter into the pan, you’ll gently fold in diced fresh raspberries. 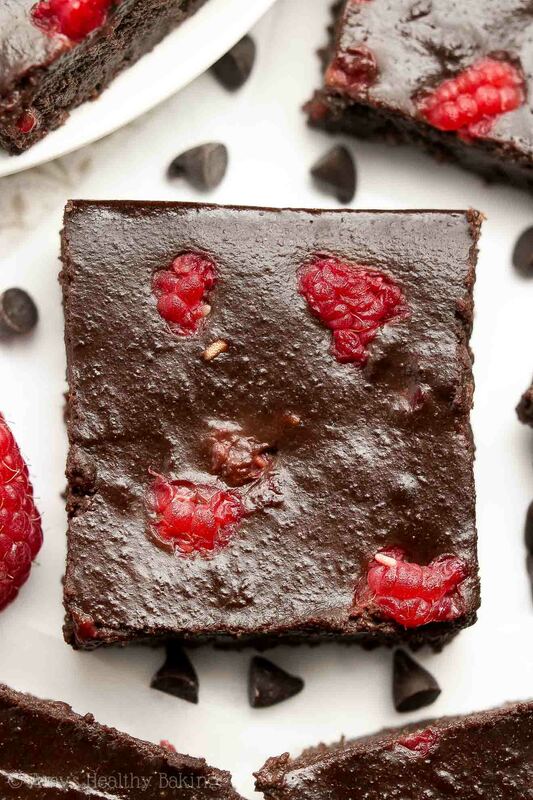 Try to cut them to be about the same size as chocolate chips so every bite of brownie has a burst of sweet fruity flavor! I also reserved a few pieces to press into the top of the batter. How cute does that look? Because this is a small batch recipe, you’ll need a small 6”-square pan. I used this one! I found it on the wedding aisle at Walmart. (That aisle actually has lots of great baking equipment and ingredients!) If you can’t find a 6”-square pan, then an 8×4” loaf pan will work, or you can use two 5¾x3” mini loaf pans. How decadent do those brownies look? 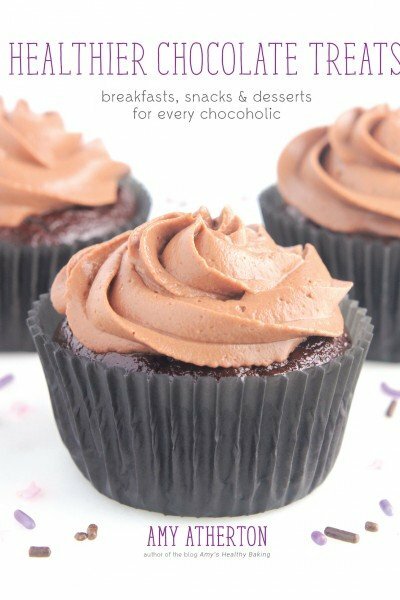 Perfect for Valentine’s Day… Or any day you’re craving chocolate! (That’s every day for me!) ? And when you make your own, remember to snap a picture and share it on Instagram using #amyshealthybaking and tagging @amyshealthybaking IN the photo itself! (That guarantees I’ll see your picture! ?) I’d love to see your brownies! 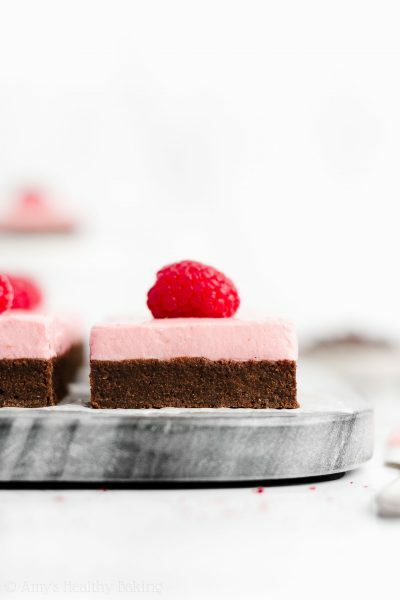 These decadent brownies are perfect for Valentine’s Day—or any day you’re craving chocolate! They’re supremely fudgy and rich, similar to the flavor of 70% dark chocolate, with plenty of sweet fruity flavor. Leftovers will keep for at least one week if stored in an airtight container in the refrigerator. In a medium bowl, whisk together the flour, cocoa powder, baking powder, and salt. In a separate bowl, whisk together the butter, egg, and vanilla. Stir in the Greek yogurt, mixing until no large lumps remain. Stir in the maple syrup. Mix in the flour mixture, stirring just until incorporated. Gently fold in 3 ½ tablespoons of raspberries. Spread the batter into the prepared pan, and gently press the remaining raspberries on top. Bake at 300°F for 12-16 minutes (12 minutes yields the fudgiest brownies; 16 minutes yields slightly firmer brownies). Cool completely to room temperature in the pan, and let the brownies sit for at least 8 hours at room temperature for the fudgiest texture before serving. For the gluten-free flour, use as follows: ¼ cup (30g) millet flour, 1 tablespoon (7g) brown rice flour, 1 tablespoon (7g) tapioca flour, and ¼ teaspoon xanthan gum. Most store-bought gluten-free flour blends (like this one!) will work as well, if measured like this. It's really important to measure the flour and cocoa powder correctly, like this or with a kitchen scale. (← That's the one I own and love!) Too much of either will make your brownie batter dry, and too much cocoa powder will make your brownies taste bitter instead of rich and chocolaty. Try to cut the raspberries to be about the same size as chocolate chips. This ensures your brownies bake evenly and that every bite contains a sweet bit of fruit! Frozen and thawed raspberries may be substituted for the fresh. 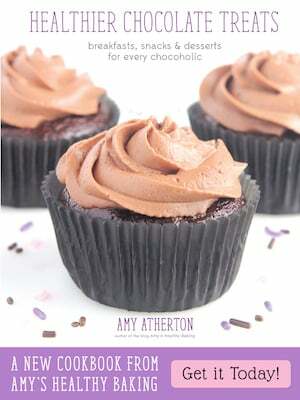 ♡ …and all of Amy’s healthy brownie recipes! 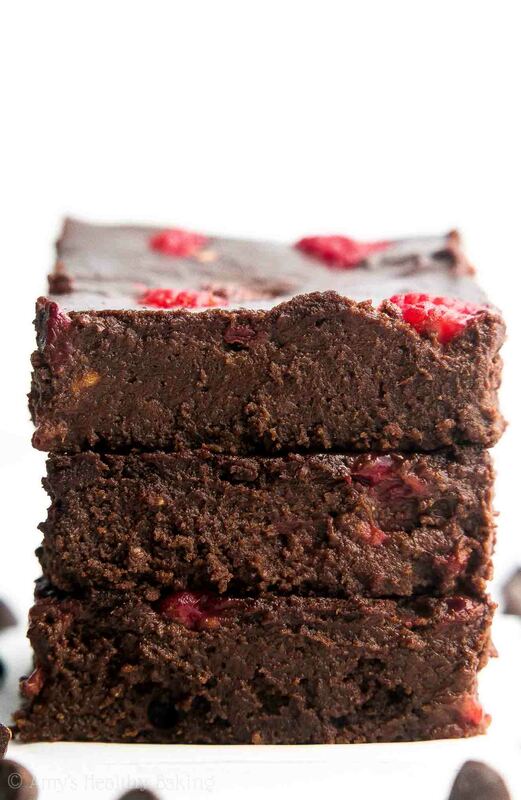 Can I make these brownies with flax egg? I think that should work! You may need to add just a hint of milk if the batter seems too dry. 🙂 I can’t wait to hear what you think of these brownies Juliette! 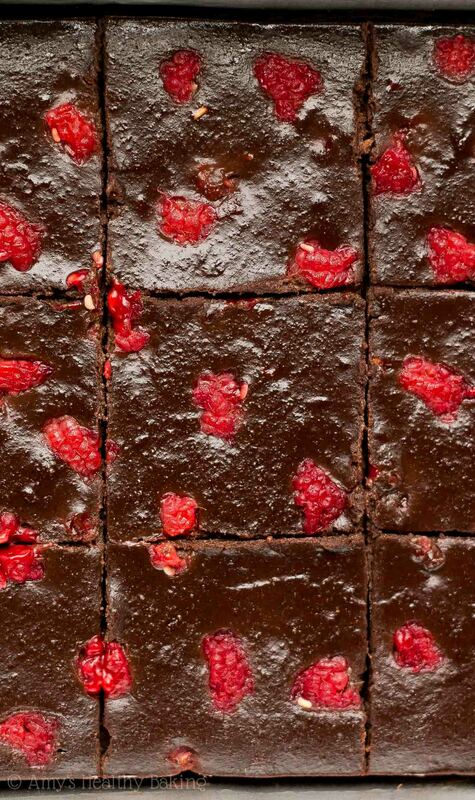 Would it be possible to make these with less cocoa and replace the amount with more flour and would it matter if I left out the raspberries, Amy I came across your site and just cant get enough of you recipes, thank you. Yes to both questions! And thank you so much for your kind words about my recipes — that means so much to me Debra! 🙂 I can’t wait to hear what you think of these brownies! Amy, Would it be possible to use some form of Stevia in these, as I cannot eat sugar, and these syrups contain a lot of sugar?? These are AMAZING!!! I also appreciate it so much that every ingredient is listed in cups AND in grams! It’s really helpful and so many people neglect that some people (like me) don’t tend to use cups as a measuring thing. I like it with just a bit more salt 🙂 amazingly done!!! I made these brownies today, carefully weighing everything out, but found them a bit dry and tasteless. They seemed quite heavy when I mixed them up. Do you think some extra yoghurt might have helped the texture and some extra vanilla might have helped the flavour? Also, I used honey instead of maple syrup. Do you think maple syrup would have made much difference? Also I think I should have turned my oven down a bit as it is a fan oven, so I’m kicking myself for that. I want to try the carrot and banana bread next; do you recommend adding more yoghurt to that if it seems to need more moisture when I make the mixture? Your recipes sound so delicious and inventive, I just want to get them right. I baked them for 12 and a half minutes. I used an 8×4 loaf tin to bake them in. I think the egg could have been bigger and I could have melted the butter better. Also I used standard whole wheat flour (though not bread flour). I couldn’t get hold of any raspberries so I used nuts instead. I have to say I tried a bit this morning and it is a little squidgier! Still kicking myself about the oven temperature as I should have known that. I suppose, having never baked brownies before, 300f seemed quite a low temperature anyway. By the way, should it be quite a heavy consistency when it is mixed? Lovely recipe! Tried it out today but sadly they burnt. I put the batter in a 8” pan as I didn’t have a 6” one for 14 minutes and I use a microwave oven so I baked them on 150C. They came out really thin and burnt. I was so dissapointed but it’s a really good recipe. If you can figure out my mistake it would be great if you could help me out. Thank you so much for your reply Amy! I just had another question. You’ve written 6tbsp (45g) for flour and 6tbsp (30g) for cocoa powder. I have tablespoon measurements and I measured both flour and cocoa powder using them but I feel there was extra cocoa powder. I put 6tbsp of flour and around 5.5 tbsps of cocoa powder but I think the cocoa powder got a little too much. Could you please guide me for accurate measurements of both. It’s my pleasure Nidhi! Those gram measurements are correct. Weight is based off of density, rather than volume. If you measured out 1 cup of cotton balls versus 1 cup of sand, they’d take up the same amount of space (volume)… But the cup cotton balls would definitely weigh less than the cup of sand! Or if you measured out 1 pound of cotton balls versus 1 pound of sand, you’d end up with a small handful of sand… And a pillowcase or two full of cotton balls! Same weight, different volume. Does that make sense? ? The same thing applies to different ingredients. 1 cup of flour weighs 120g, whereas 1 cup of cocoa powder weighs 80g. (Check the nutrition label on the sides of your packages — they should show the grams per serving, which is usually grams per ¼ cup for flour and grams per tablespoon for cocoa powder!) ?